Custom Tailored Solutions for Dedicated Freight. At FirstFleet, we take great pride in creating custom tailored solutions for our business partners. No two businesses are alike and therefore neither are their transportation needs. As a business partner, our goal is to jointly create a solution that is adaptable over time and that accomplishes the goals you specify. These objectives are supported by employing three primary disciplines of transportation execution. Dedicated service is our flagship offering. Dedicated transportation provides our partners with the ability to increase their levels of service while maintaining a manageable and predictable cost structure. Using this transportation model, we are able to provide end to end logistics and transportation coordination while moving freight on our equipment driven by our professional team. By operating well maintained, late model tractors driven by the best drivers in the industry we are able to reduce equipment downtime and provide nationwide service with 99.7% on-time delivery. Our mobile tracking systems and full suite of electronic offerings provide true end to end freight visibility. With service to the entire upper 48 states we are daily providing truckload services to customers in a diverse set of markets. In high volume operations which must rely upon outsourcing transportation models FirstFleet offers coordination and management of the carrier relationships and billing processes. 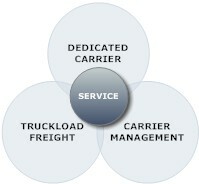 We provide a single source of contact for carrier management, bidding processes and logistics coordination. A solid platform of nationwide FirstFleet equipment is available to insure the timely delivery of all partner runs.